Over the years, I practiced hard and eventually became a low handicapper. 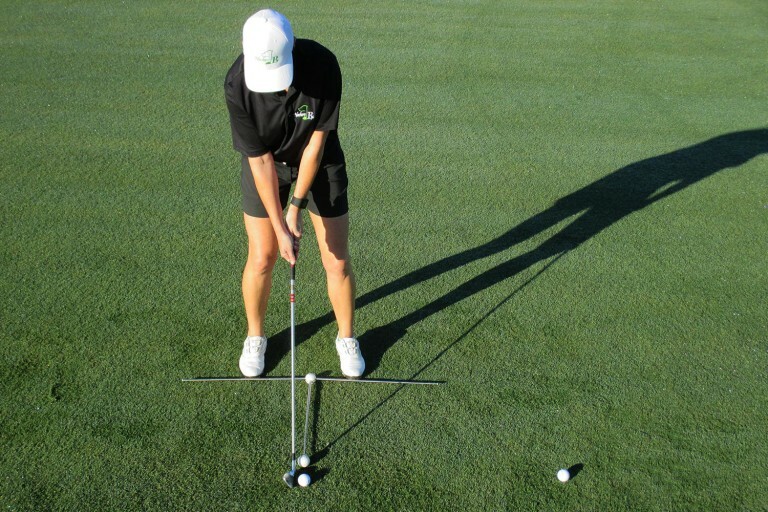 When I practiced, I placed clubs on the ground, as we all have, to develop a “practice station.” Then I progressed to some custom-made alignment rods. I therefore realized that I really did not need a second alignment rod on the ground. As I became a better golfer, correct ball position became more important. Laying a club on the ground perpendicular to the stance line was my first option to teach me where ball position should be for a chosen club. Then, I started putting a golf ball on the ground along my stance line to give me ball position guidance. Thus, Swing Station was born! The practice station makes you “take dead aim” at the target and the “ball positioning” of the Swing Station training aid gives you confidence that you are indeed positioning your golf ball in your stance where you want it depending on the club your using, as you can see in this site’s Use It section, which provides a brief tutorial with photos to help you set up your Swing Station. Swing Station will give all golfers a consistent quality practice session to better their games. For amateurs, it teaches correct stance, aim and ball position. For the professional, it reinforces and refines good fundamentals. Swing Station is the prescription for proper practice.